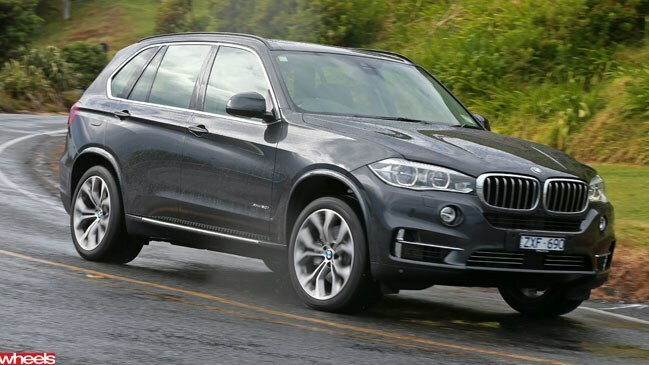 The golden goose of the large SUV segment, the BMW X5 has been preened for yet greater refinement into 2014. IF IT ain’t broke, don’t fix it. That’s BMW’s approach to its new, third-gen X5 and who can blame it? After spawning the original SUV golden goose with the E53 X5 in 1996, BMW has hardly altered the X5’s fundamental, money-making recipe: punchy engine up front, a luxurious, practical interior in the middle and tasty driving dynamics, with some off-roading ability, underneath. But that’s not to say this new model is devoid of newness. Yes it rides on the same platform and uses the same front suspension, but there are new engines, a new rear-drive sDrive 25d variant and a body with no carry- over panels. At $82,900, the 25d is designed to entice new buyers to the brand. Powered by a twin-turbo four-cylinder diesel churning out 160kW/450Nm, it’ll shoot the porky X5 (all variants weigh just over 2000kgs, despite BMW claiming new models are 5-40kg lighter) from 0-100km/h in 8.2 seconds, yet sip just 5.8L/100km. Sadly, the 25Dd, as well the 40d and the petrol-powered straight-six 35i won’t arrive Down Under until March 2014, with only the popular 30d, the 4.4-litre twin-turbo V8 50i and the new monstrous, triple-turbo M50d available from launch. As you’d expect, all models have been suitably refined to make each variant not only faster and more efficient, but importantly more comfortable. Power is up across the board, apart from the range-topping M50D, which despite having three turbos bolted to its 3.0-litre straight six, keeps the 280kW/740Nm output of its twin-turbo predecessor. Still acceleration for the big diesel is rapid, down to 5.3 seconds from 0-100km/h. Both models are brutally quick and concise when driven hard, but unless you’re racing Porsches on the school run, it’s the 30d that offers the best compromise on speed and comfort. The volume model 30d (BMW reckons up to 70 percent of sales) gets 19inch wheels as standard instead of the 20s assigned to its more powerful siblings and it’s all the better for it. None of the X5s we sampled rode badly, but the 30d conveys a suppleness absent in other models, despite a hint more body roll through the twisty stuff. Power is ample too, with its 190kW/560Nm 3.0-litre turbo six pulling strongly down low, but it can’t match the 50i’s subtle V8 burble or the M50D’s angry bark. All third-gen X5s are mated to BMW’s excellent eight-speed auto, which not only shifts seamlessly, but keeps the power in the rev-range sweet spot to offer sharper acceleration and eradicate turbo lag. Punt the 30d hard, and while it’s not in the same league as the barnstorming M50D, on the limit handling remains impressive, effectively disguising the X5’s size and weight to convey a sporty and planted feel, even without the new adaptive dampers. Inside, everything is suitably luxurious and functional, with all models receiving a large 10.2 inch touch screen and a myriad of trim options. As has become customary, each X5 variant gets BMW’s rocker switch to alter the car’s drivetrain and chassis from docile (EcoPro) through to roid-raging bonkers (Sport Plus).